Teacher-basher and former New York City Emperor Mike Bloomberg has been granted an honorary knighthood by the Queen of England. Apparently she'll do anything to get an invite to his palace, which doubtless makes hers look like an outhouse. Emperor Mike is a great philanthropist, investing not only in reforminess, but also political candidates who support his philosophy of buying office outright and changing laws to thwart democracy, otherwise known as term limits enforced by direct vote. We interviewed Bloomberg, who was typically pissed off. "It's a bunch of crap," he told us. "I can't use the title Sir because I'm not a British citizen. The racist bastards. Do they know how much money I have? Them with their socialist medicine? I could probably buy the whole damn country with pocket change. The whole damn country!" 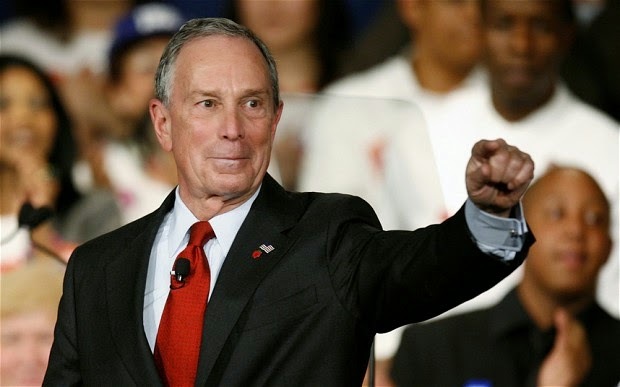 Mayor Bloomberg is a political independent. Having been a lifelong Democrat, he found the field too crowded with actual experienced politicians and decided what the hell, he'd run as a Republican. He later decided he didn't want to be identified with either political party, but was advised, despite all his money, that he could not actually run as a Certified Deity. He then relented and ran again as a Republican, or an Independent, or some such thing, and managed to buy himself a third term. His proudest creation is Eva Moskowitz, who managed to get Cuomo to do any damn thing for her even though Cuomo refused to do it for Bloomberg, feeling threatened by All That Money. Moskowitz pulls in a piddling half-mil a year, and everyone knows you can barely buy a house with that nowadays. Bloomberg plans to create a huge mosaic of himself to hang in a stadium he names after himself. He has not yet determined whether said stadium will be erected in Britain, America, or North Korea, but he plans to bestow his own knighthood on himself, after which he will be called Sir Emperor Supreme Leader Mike.